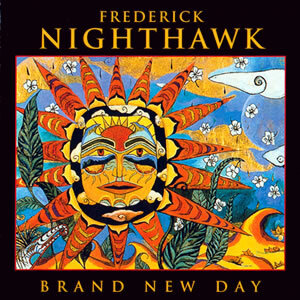 Brand New Day is Frederick Nighthawk’s fourth release for Red Mountain Records. Frederick Nighthawk is a rising talent in the San Francisco Bay Area. As a pianist, singer, and songwriter, he combines styles from his background which is rich in the areas of blues, country and jazz. He has a unique style. After producing two albums of solo piano music, Rivers Without End (1991), and Gathering Wave (1996), Frederick was ready to go back into the studio to record another ensemble collection of original songs. He assembled some of the best musicians in the San Francisco Bay Area to help bring his songs to life for Brand New Day. He was joined by Kester Smith on congas (Taj Mahal), Rob Sudduth on saxophones (Huey Lewis), Jimmy Hobson on drums (The Sundogs), Kyle St. John on bass (Gator Beat, Jo-El Sonnier), Indiana Slim on guitar (Shakin’ Snakes), and Gary Vogensen on guitar (New Riders Of The Purple Sage, Angela Strehli). The finished recording hits the listener with Nighthawk’s special blend of Rhythm and Blues, songwriting, powerhouse piano playing, and soulful vocals. His original compositions on Brand New Day echo the inspirations of many diverse voices such as Van Morrison, Boz Scaggs and Delbert McClinton. You will hear how his music also mirrors that of blues artists B.B. King and Muddy Waters. Again you will notice the New Orleans style rhythm much like that of Professor Longhair, Dr. John and James Booker. Frederick has been a sideman to Southern rocker Jimmy Van Zant from Lynyrd Skynyrd, Bluegrass great Peter Rowan, beat poet Allen Ginsberg and Tex Mex legend Flaco Jimenez. Currently Frederick Nighthawk plays over 250 solo and band dates a year in the San Francisco Bay Area and Northern California region. Brand New Day is must for lovers of New Orleans R&B, Blues,and Americana roots rock and roll!